Quilts came to Japan at the end of 1970 as a new hobby from America. Since then, the Japanese quilters have developed their own style using traditional fabrics and motifs. We are fascinated by the meticulous applique and quilting, which we've tried to capture in close-up photos. Each of these quilts is more than 6 feet across, which gives you an idea of the amount of work involved in these creations. This is part 2 of a two-part series. We're also selling beautiful quilt books at low prices on e-Bay ! Quilts came to Japan at the end of 1970 as a new hobby from America. Since then, the Japanese quilters have developed their own style using traditional fabrics and motifs. We are fascinated by the meticulous applique and quilting, which we've tried to capture in close-up photos. Each of these quilts is more than 6 feet across, which gives you an idea of the amount of work involved in these creations. This is part 1 of a two-part series. 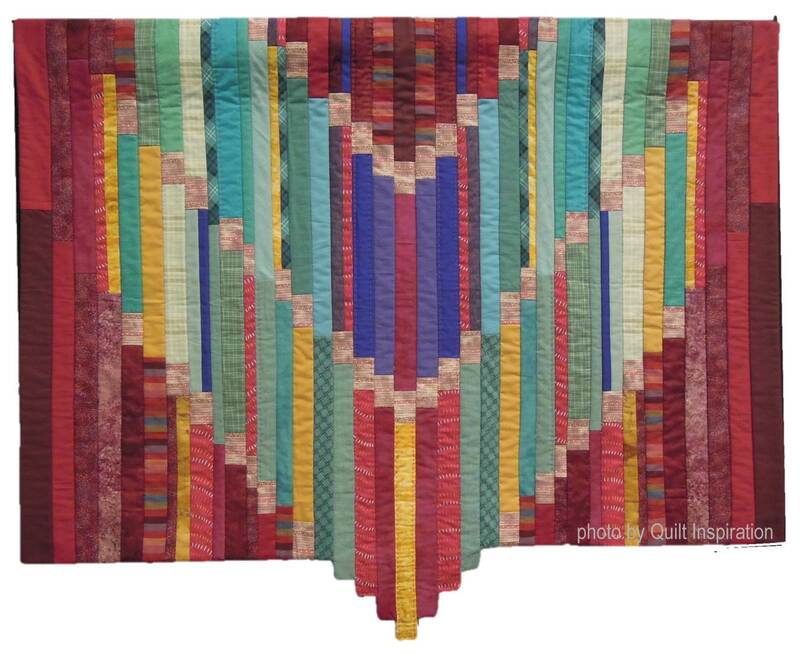 Bargello quilts are fascinating patchwork designs made of small squares or rectangles, pieced together so that they create waves of color, often in a zig-zag or "flame" pattern. The name originates from the Bargello palace in Florence, Italy, where the chair seats were done in needlepoint with the flame stitch motif. Jodi writes, "I centered a round bargello pieced quilt in a black square, added the leftovers, and voila: Spiral Galaxy. It is longarm quilted, glitzed, and glittered. " Spiral Galaxy was inspired by Quilts Without Corners by Cheryl Phillips and by photos of outer space. Kathy's pattern source was a photograph of a quilt made in the 1970's. She drafted a pattern based on a strip quilt. Visual interest is added by the pointed motif which drops down below the bottom border. Her work is machine pieced and hand quilted. Kathy notes, "These are the colors that surface when I think of a Southwest quilt. Being a "snowbird" (a winter visitor to Tucson) from the Northwest, I just had to put this one on my wall." Ann explains that she was inspired to use the print colors of a blouse she purchased at a garage sale. She reverse-appliqued them to the black background, creating a lovely rainbow effect. Ann's quilt is one of a series inspired by the Aurora Borealis (Northern Lights), which appear in the northern skies over Canada. Susie says of her original design, " I'm often asked how the basic two-fabric bargello can be enlarged for more practical purposes. I made this version in an effort to answer that question and to know how much more fabric is needed. I now have those answers. " Susie's experiment in pattern enlargement turned out beautifully, as did Pam Knight's quilting. The quilting pattern replicates the curved "squiggles" of the contemporary print fabric. Ruth states, "The quilt top was made in Susie Weaver's Two-Fabric Bargello class in 2011. Susie gave quilting suggestions, but my top languished until I finally got the courage to try some free-motion quilting in the "peak"[of the bargello motif] and the border. Thanks, Susie !" We love these soft, refreshing colors which gives Ruth's quilt such a relaxed, tranquil look. Red ribbon winner for a first time entry in the Tucson Quilt Fiesta, Camille writes, " I have wanted to create a quilt for my bedroom for awhile. When I saw Nancy Landon's "Palo Verde Spring" pattern, I knew I wanted to use my favorite colors: purple and green. The name came from my toddler granddaughter, who when asked, stated the features of the quilt and whom it belonged to." Camille's border in pastel colors provides a great contrast to the deeper shades of the main body of the quilt. The pink, lavender, peach, and mauve flowers dance happily on their vines on all four sides.